Why do the French still matter? Inexplicably France is still seen as a force on the world stage when in reality they have been irrelevant since 1870. 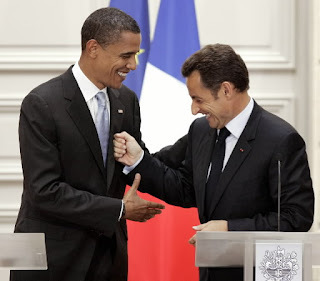 So after a week in Europe where Barack Obama was feted and cheered, Nicolas Sarkozy has decided to open his big, fat mouth. A Times article has various quotes attributed to Sarkozy at recent meetings. The newspaper reports that while he sees Obama as a smart fellow "he was elected two months ago and had never run a ministry. There are a certain number of things on which he has no position. And he is not always up to standard on decision-making and efficiency." The other claims in the article are that France pushed a weak Obama into movement on climate control and that the President of the USA is "naive". He also called a number of other European leaders stupid and pulled a Berlusconi by calling a black priest "suntanned". He also told a black child that he wished he had as much time to sun tan as him. I'm sure his wife is proud of him considering what she said about Silvio Berlusconi. Oh Nicky boy must feel like Britney now that Lady Gaga is around. Only two years ago he was the hippest leader around and had caused a sensation by marrying a supermodel. Now after leading the dead carcass that is France for two years he is a familiar face. Don't worry Nicky France still gets invited to the hottest parties. It's just that Obama gets all the flashbulbs now.